Toledo, who holds the unique distinction of being the first athletic director at Pima Community College, played varsity baseball and basketball and was an All-City/All-State football quarterback while attending Pueblo High School in Tucson from 1955 until 1959. He also was a student-athlete Thom McAn National Award winner and was active in amateur boxing (Cathedral Boxing Club, 1947-56); was a member of the Tucson Little League champions (1951-53) and played in Pima County Recreation After-School Athletic Leagues (1951-54). 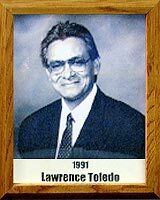 Toledo continued his sports endeavors during college in California where he was an All-American Honorable Mention in the All-SCAC Conference (1960). His California Western University team was SCIAC champions (1961-63) during which time he was co-captain; was named Most Valuable Player and earned another Honorable Mention as an NAIA All-American. His football and basketball coaching careers spans many years at Brophy College Prep, California Western University, Arizona State Industrial School for Boys, and Pueblo High School. Among his multitude of activities, Toledo, a former member of the Arizona Governor’s Council on Physical Fitness, serves on the board of directors of the National Association of Collegiate Directors of Athletics and is a member of the executive board of the Foundation for Creative Broadcasting (KXCI Community Radio) in Tucson.